The University's Special Collections team was awarded a funding grant from the National Manuscripts Conservation Trust (NMCT) for the conservation of the chart in collaboration with private conservator Richard Hawkes (Artworks Conservation). The funding also allowed production of a full-size facsimile which is now on display in the School of Chemistry. The original periodic table has been rehoused in conservation grade material and is held in Special Collections' climate-controlled stores in the University. Gabriel Sewell, Head of Special Collections, University of St Andrews, added: "We are delighted that we now know when the oldest known periodic table chart came to St Andrews to be used in teaching. To be officially recognised by the Guinness World Records is a wonderful achievement. Thanks to the generosity of the National Manuscripts Conservation Trust, the table has been preserved for current and future generations to enjoy and we look forward to making it accessible to all." The Periodic Table and Us: Its History, Meaning and Element Scarcity, hosted by former University of St Andrews Rector Catherine Stihler MEP took place at the European Parliament in January 2019. 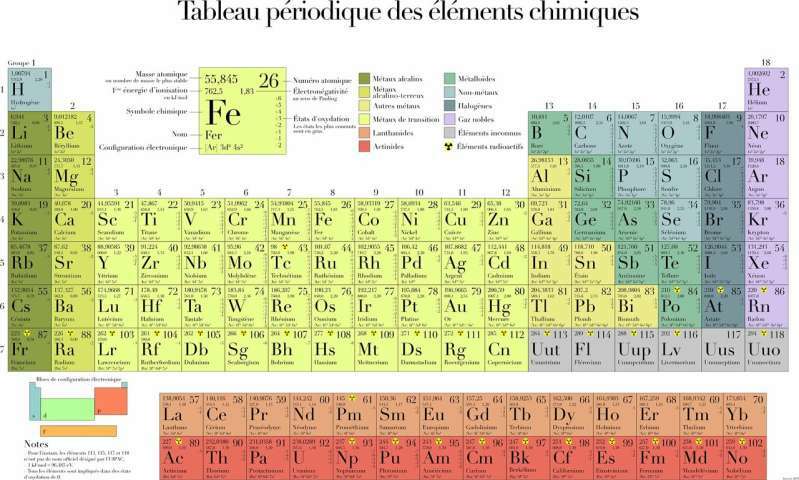 The event also unveiled a new periodic table showing the scarcity of elements used in everyday devices.